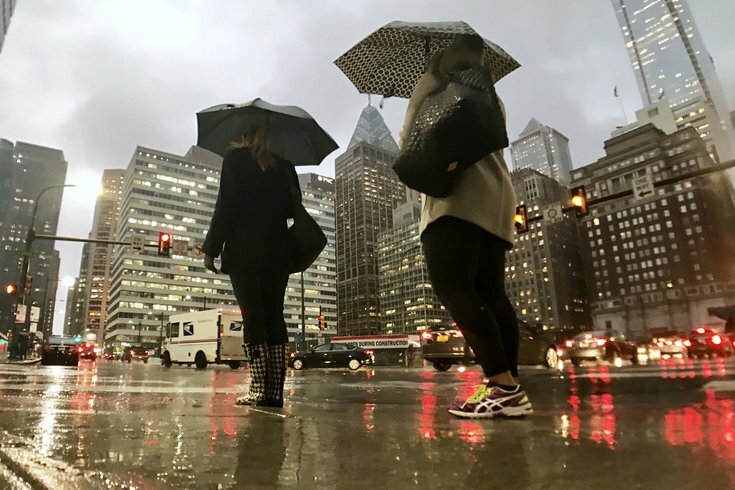 Passersby sport umbrellas and rain boots during a recent rainy day in Philadelphia. Autumn's continual spiral toward the endless drudge of winter is in full force, with a wintry mix and freezing rain a possibility in this week's weather forecast. Rain is predicted to pick up in Philadelphia tonight around 9 p.m. and continue heavily overnight and then lingering into Tuesday morning. It is unlikely that the wet snow headed for the Poconos will reach Philadelphia and most forecasts are predicting only rain in the region for Monday night and Tuesday. After a cold and windy Wednesday, temperatures are expected to reach the low 30s on Thursday morning, when the chance of snow is most prevalent. Reports show a 70 percent chance of precipitation on Thursday. Depending on when exactly the cold air moves out and the precipitation moves in, the twain could overlap, creating a wintry mix. If the cold air moves out before the precipitation picks up, it could be a more mild, rainy day, with temperatures in the 40s. The forecast shows precipitation continuing through Friday, when temps will jump to an average in the high 40s. If there turns out to be any Thursday flurries, they'll be melted away by Friday. • Monday: Mostly cloudy, with a high near 49. Southeast wind 3 to 5 miles per hour. • Monday night: Rain, mainly after 8 p.m. Low around 43. East wind 3 to 7 mph. Chance of precipitation is 100 percent. New precipitation amounts between three quarters and one inch possible. • Tuesday: Rain, mainly before 10 a.m. High near 53. Southeast wind 9 to 14 mph becoming northwest in the afternoon. Chance of precipitation is 80 percent. New precipitation amounts between a quarter and half of an inch possible. • Tuesday night: Mostly cloudy, with a low around 33. Northwest wind around 10 mph. • Wednesday: Mostly sunny, with a high near 41. Northwest wind 9 to 11 mph. • Wednesday night: Partly cloudy, with a low around 28. • Thursday: Rain likely after 1 p.m. Partly sunny, with a high near 42. Chance of precipitation is 70 percent. • Thursday night: Rain likely. Mostly cloudy, with a low around 40. Chance of precipitation is 70 percent. • Friday: A chance of rain. Mostly cloudy, with a high near 54. Chance of precipitation is 50 percent. • Friday night: Partly cloudy, with a low around 38. • Saturday: Mostly sunny, with a high near 50. • Saturday night: Partly cloudy, with a low around 33. • Sunday: Mostly sunny, with a high near 43.